If you live in New York, you've acquired a certain set of skills to survive in an urban environment...like hailing cabs, rooftop gardening, and texting while you walk down the sidewalk. But, you never know what other environments you will find yourself in, so we think it's best to be prepared for anything. 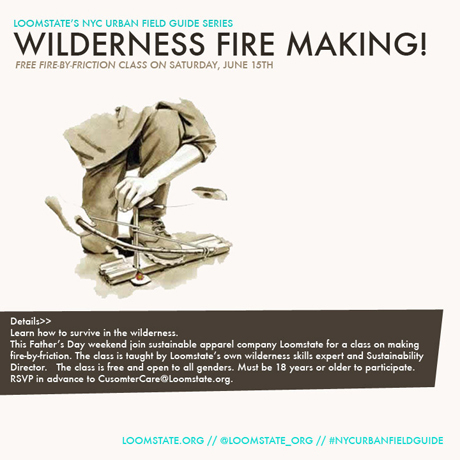 That's why we've created the NYC Urban Field Guide summer class series, so you can learn the skills necessary to survive in any setting...and impress your friends with your wilderness awareness. We will be offering classes throughout the summer on different topics. The next class is coming up on June 15th, free and open to all genders. Come learn how to make fire by friction, a first step to surviving in the wilderness. To find out about upcoming classes, check the NYC Urban Field Guide class calendar or sign up for the Loomstate newsletter.